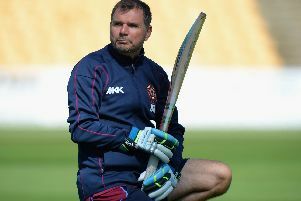 Injury problems and international player selections are making life tough for Northamptonshire head coach David Ripley. Fast bowler Olly Stone has been ruled out for the season after damaging his anterior cruciate ligament and cartilage while celebrating a wicket in the match against Worcestershire last week. But the County have also been hit by injuries to South Africans Richard Levi and Rory Kleinveldt while Sri Lankan overseas star Seekkuge Prasanna has been called up by his country for the one-day series against England and will miss a large chunk of the club’s NatWest Blast T20 campaign. With a lack of numbers in the playing staff at Wantage Road it has left Ripley with some holes to patch. “It’s not been a great week – I haven’t had a great deal of sleep!” the head coach admitted. “The situation with Seekkuge is disappointing. “We heard there was a chance he might be selected but the wheels have moved really slowly on it which is frustrating. “The delay (in his call-up being confirmed) has left us with very little time to find a replacement. “We knew a call-up could happen but we thought he was well down the pecking order. “When we signed him he had been left out of their World T20 squad and he wasn’t even called up when they had an injury replacement. “Now, because everything has moved so slowly, it has cost us in terms of who we might be able to attract. “We had some really good options but couldn’t go through with them until we knew for certain because we had to de-register Seekuge to do it. “It’s also a short stint – five matches at the most – so no one is going to get rich coming for that time. There is the added problem of what the Steelbacks look for in terms of a replacement. With injury concerns hanging over Kleinveldt and Levi and Stone confirmed to be missing the whole campaign, it leaves a certain amount of doubt about where they need to strengthen. Ripley added: “We’re waiting on a scan for Rory while Richard is seeing a specialist. “We’ll know more when they have come back. “It means, at this moment, we’re not exactly sure where we are. “Richard’s scan (on his shoulder) suggested there was a problem there but not necessarily something that would rule him out for months which we had feared at first. “Rory had a runner because of a tweak in his calf but that cleared up. However, he was then feeling his side and it seems he’s got a strain. “If it’s anything more than a grade one, as a bowler, he’s going to miss at least a month. The one certainty on the injury from is Stone’s absence. He hurt his ACL when celebrating the dismissal of Moeen Ali during the T20 win over Worcestershire. And Ripley has a huge amount of sympathy for the young fast bowler. “I feel very disappointed and very sorry for Olly,” he said. “He’s a good professional who works hard and just seems to be very unfortunate with injuries – whether it is a broken finger, a bad back or a freakish one like this.